“Save the Che” protest march, October 2014. Photo by Fred Lonidier. 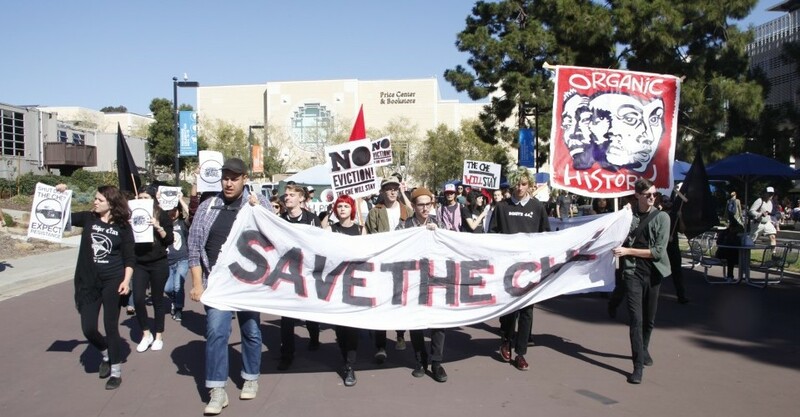 The student collective that runs the Che Cafe up at UCSD fears that the university will actually attempt an eviction the morning of Tuesday, March 24th. So, they’re holding a rally before the eviction – all really early in the morning. The Che Cafe Collective is asking friends, alumni and supporters to show up at 5 a.m. to show solidarity in front of the anticipated eviction action at 6 a.m. Need a refresher on what’s going on? See this report by Andrea Carter and this from last November. UCSD has vowed to carry out its eviction of the Ché Café Collective on Tuesday morning at 5 a.m. Together, with support from community members and students alike, we have fought for nearly a year to prevent this day from coming. Despite our struggle, the administration of UCSD has not budged and instead seems intent on seeing the eviction through. Together, we can stand up to them. Together, we can prevent the closure of the Ché. We know that in the past, the only thing that has ever prevented the university administration from shutting down the Ché is community pressure and direct action. We cannot win this fight without your help – and it has all come down to this day. Please show up at 5 a.m. or earlier with picket signs, noise makers and megaphones. Wear comfortable clothing and shoes, stay hydrated and bring snacks. For those who show up early, there will be donuts (w/vegan option) and coffee available. Invite anybody and everybody from your friends list to attend, we need as many bodies as possible. We have won this battle many times in the past – we will win once more. ALL OUT TO SUPPORT THE CHE! Please see below a collection of the local news reports today. Although reporters tend to find the facts complex and may get various points not quite right, they are attracted to this story like iron to a magnet because they know there is truly ‘something rotten in Denmark’. You are giving UCSD a black eye. You know the C.H.E. Cafe is not only supported by punk rock fans in their teens and twenties, right? You know that doctors, lawyers, engineers, scientists, journalists, editors, artists and intellectuals and highly respected professionals in all spheres also support it, right? If you think the past year of conflict over the C.H.E. Cafe is nearing an end point, you are sorely mistaken. Now that you have actually served an eviction notice on the C.H.E. Cafe Collective, the real conflict is only just beginning.The Artists’ Boycott of UCSD will expand. An Alumni Boycott will be started. You may expect to see the misconduct of your administration become an issue in the Academic Senate. Your tenure as UCSD Chancellor may prove to be one of the shortest in history. You can stop this at any moment. Stop the eviction. Restore the lease. Stop lying about the safety and structural soundness of the building. It is not truly an old building, even. Certainly not by East Coast or Old World standards. Instead of creating intense divisions in our community and wasting probably more than $100,000 of tax-payer money on attorney fees and court costs (thus far), trying to obliterate a cultural and educational treasure and a shining light of University Diversity, you could devote a little energy toward nurturing it. You could seek alumni donations and endowments for it, and for the other campus student cooperatives. Perhaps this is all a matter of you getting very bad advice and incomplete information from your subordinates. You could publicly say so and apologize. You could replace some of them.